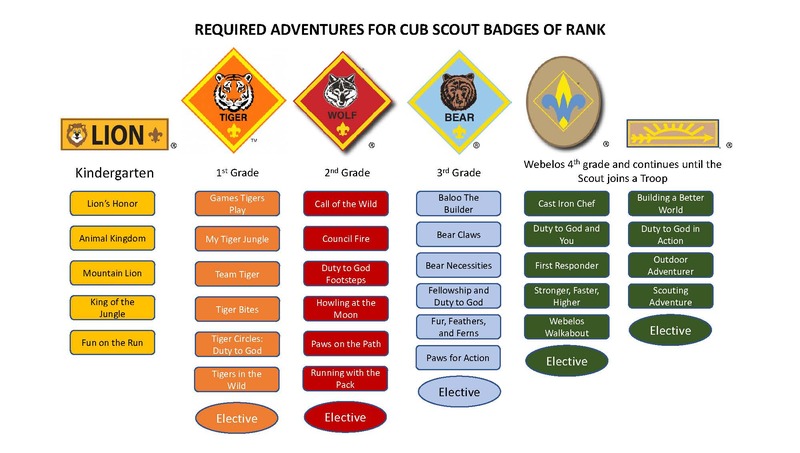 Cub Scouts do most of their activities with their den – other scouts in the same age/grade-based rank (Lions, Tigers, Wolves, Bears, WEBELOS, Arrow of Light). Cub Scouts work with their den to complete adventures, which are part of a prescribed program as well as any other adventures the leaders plan and conduct, like field trips to local points of interest, or hikes and service projects. These adventures are age-appropriate ways to experience STEM, civics, history, athletics and fitness, and many other exciting activities. When they complete the requirements in an adventure they are recognized with an award commemorating that adventure. Sometimes the award is a pin or patch, other times it’s a specific beltloop to wear on their uniform. Regardless of the device, it’s always exciting to celebrate the achievements and fun to share the stories and memories that the award represents. Official BSA Cub Scout Program details can be found here. Each program year (rank) has a set collection of adventures that is considered core, or required to complete that rank. There are also elective adventures which are available for dens to incorporate into their program plan, or for scouts to complete on their own with their family. Each rank has different requirements for advancement, but there is always a minimum balance of civics, fitness, outdoor activity, and personal expression of faith. 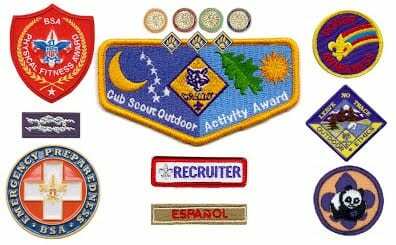 There are lots of other awards that Cub Scouts can enjoy achieving – some are earned through service, others through participation in a particular event, while others are received when they have attained a particular combination of requirements or milestones.